"It seems heartless to see women caring for curls and colors." When Dorothea Dix assigned northern women as nurses, she placed restrictions on their type of dress. "All nurses are required to be plain looking women," she stated. "Their dresses must be brown or black, with no bows, no curls, no jewelry, and no hoop-skirts." However, for many murses of the North or South, such regulations were not significant. As the War progressed, female nurses learned to adapt their clothing to the conditions at hand. Dresses were often dark in color, either solid or patterned, so that filth and other stains would not easily be seen. These dresses were also primarily constructed of cotton fabric, which could easily be washed when soiled. Cage crinolines were almost never worn because they got in the way of work, so petticoats were worn instead. Hospital aisles were so narrow that women's hoops could not fit between them. Jane Grey Swisshelm once recounted an event in which another woman wearing a cage crinoline proceeded to walk down one of the aisles of hospital cots. She passed a soldier who was cautioned by the Surgeon in Charge to remain "in absolute stillness" unless he wished his wound to tear open. The woman caught her hoop on the cot the soldier was lying on, the sudden jolt opening his wound and causing him to soon die from the loss of blood. Two views of the same dress, worn by Mrs. Beach during her service as a nurse. 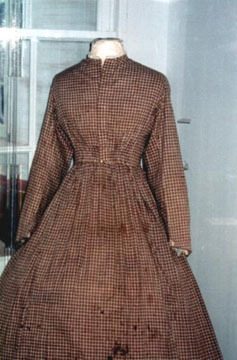 This is a typical work dress made of cotton with a calico print. Notice the blood stains on the fabric, all of which have been tested positive for human blood. The range of garments worn by female nurses varied greatly. 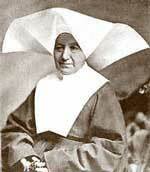 The Catholic Sisters wore their traditional black habits (although, the Sisters of Charity wore blue habits). Georgeanna Woolsey favored a zouave jacket, blouse, and skirt rather than a dress with a fitted bodice, because the jacket gave her "free motion to the arms." 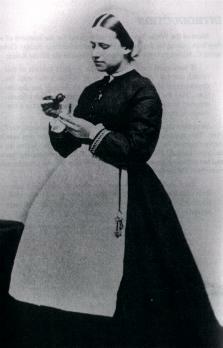 Katherine Wormeley believed flannel shirts were the most comfortable garments to wear when on duty. Nurses from the Portsmouth General Hospital in Rhode Island devised their own uniform "consisting of a skirt of blue army flannel, a zouave jacket lined with red with gilt United States buttons, and a round hat and cavalry gloves." 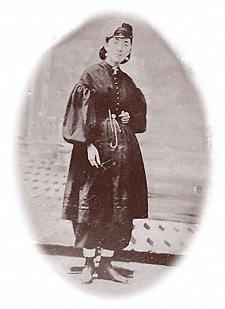 Amanda Farnham was known to wear the "Rational Dress" or "Bloomer Costume" when she worked, consisting of "full pants buttoning over the tops of her boots, skirts falling a little below the knee, and a jacket with tight sleeves." We must understand, however, that generally these forms of dress were not frequently worn by nurses. Notice the contrast in clothing between the Sister of Charity and the nurse wearing the "Bloomer Costume"
The most common style of nurse attire was nicely illustrated in an 1862 article written for the Chicago Times. It expressed that "[t]hey [nurses] seem imbued . . . with the idea that there is nobody to look at them, and the customary attire is a faded calico loose gown, straight from top to bottom, ignoring waist and personifying the theory of the shirt on a bean-pole." Nevertheless, such dress made work for the nurses much easier to accomplish. 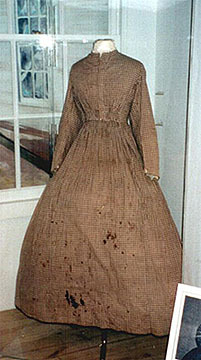 An apron (either white or patterned), work shoes, and sometimes a bonnet of some sort, usually completed the outfit. The hair was then tied back, most likely into a bun at the nape of the neck, and a few even held their hair back in a dark hairnet (although this was not as common). However the nurse wore her hair or clothed herself was adapted only so she could conduct her tasks in the most efficient manner. 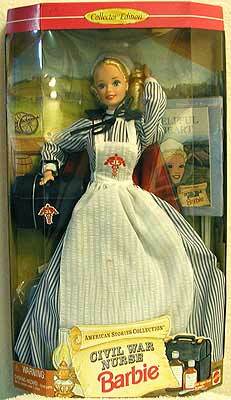 Unlike how this Barbie is dressed, the real Civil War nurses would never have worn such attire!